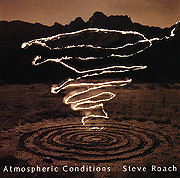 Atmospheric Conditions by Steve Roach was inspired and later compiled from several experiences in the concert setting, further proving the value of a gathering of listeners centered around a musical performance. Atmospheric Conditions evolved out of Roach's travels and concerts in such diverse places as the beautiful hills of Tuscany and the urban setting of the studios where STAR'S END originates. "Atmo" is one lengthy piece, moving slowly between four movements. The studious fan of subterranean soundworlds will find several reference points throughout this recording. After a stormy beginning, the clouds slowly part and we embark on a steady, subtle section of soft percussion and new rhythm patterns. The CD closes with a gentle track evocative of the reverent Deep Listenings weekend where the piece was recorded.